Attached are photographs of a vase that has been in our family for several years. 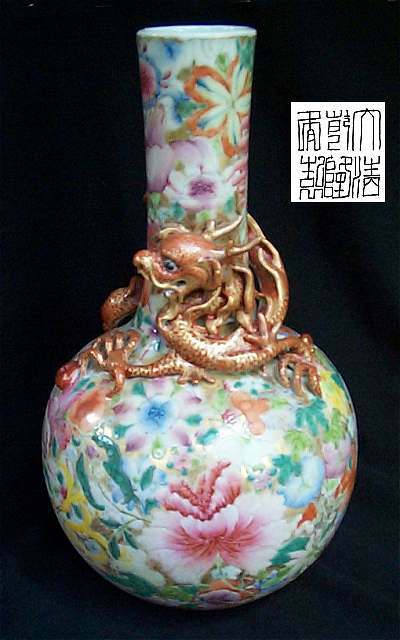 I have only recently been learning about Chinese porcelain so I can tell some about this vase. The background, you may notice is gold. The only damage is that the ceramic dragon has got the tip of one back fin chipped off. We also did an enlargement of the bottom "reign mark" in ink and have scanned and sent it. I may have insight into the Dragon and Flower motif. I have been a practicing Buddhist for over 20 years. The teachings I follow came from a Northern Chinese, Mahayana priest Tien Tai who recognized the Lotus Sutra as the supreme teaching of the Buddhism. Within the Lotus Sutra is the parable of the Dragon King and his daughter. It tells of the Dragon King's daughter attaining Buddhahood without changing form. In gratitude the dragon king vowed to protect the Lotus Sutra. It is recognized as the essence of the Lotus Sutra, teaching that we can attain Buddhahood in our present form as human beings. Recently, I noticed that under the belly of the Dragon (in the most protected position) is the only Lotus Flower. I am certain that this vase is depicting that parable. Also since there is a very large flower, (that I do not recognize) directly under the dragon's torso, I assume it is relevant to the story also. I would be very grateful for any information you can provide about this vase. Being a westerner with limited insights in Buddhism I am very grateful for your information. The vase itself most probably dates to the 20th century but seems to be of a surprisingly high quality. If possibly I would actually like to have a direct scan of the mark, since this would be critical for the dating. The peculiar way in which the first (Da) character is written - the way the strokes are branching out - gives strength to my assumed date, though, but since the vase is of a high quality it would be fine to be sure it is not actually of the Qianlong period as the marks suggest. I don't think this is the case, though, since there also seems to be a little rim to the top edge of the neck, which is a feature never found on Qianlong period pieces. As for the decoration I have little to add. The large red and white flower below the dragon is anyway a peony - most often referred to as a symbol of spring and female beauty and as such it could most probably fit into your story as a symbol for the daughter of the Dragon King. Thank you again for submitting this interesting picture and story.